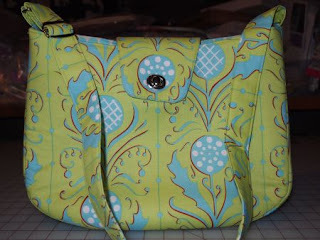 I recently test sewed a bag for Sara Lawson of "Sew Sweetness." This is a great bag, with a unique closure that twists to lock. Hence, Sara calls it the "Locked and Loaded" bag. Sara shows photos of several other sample bags on her blog post here. I love that she included an adjustable strap. I don't like to carry a shoulder bag -- they always make my back hurt. Do you have that problem? Sara recommends "ByAnnie's" Soft and Stable interfacing. This type of interfacing looks like very thin foam rubber with fine knit fabric on each side. It really makes the bag stand up nice, without being heavy. The Locked and Loaded bag also has a zipper pocket inside. If you've never put a zipper pocket in a bag, Sara's instructions make it easy peasy! Of course, I hope she has amended the pattern to remind the maker to put the zipper against the BACK side of the bag, rather than the front. We'll just pretend I meant to do that. This bag is larger than a purse I would normally carry, but it will make a terrific knitting bag! You say I mentioned a Giveaway? Right-o. How about a pattern of your choice from Sara's collection of bag patterns? Just go here and look over her patterns. Then come back and leave a comment telling me which is your favorite. If you're the winner, Sara will email you a PDF copy of the pattern of your choice! Giveaway ends Sunday, March 3 at noon MDT. If you're a no-reply commenter (or anonymous) please be sure to include your email address in your comment. Of course, international entries are welcome! Linking up to "Weekending" at 1/4" mark. Only three more days to finish your February UFO. Send in those photos by Thursday to be included in the 13 in 2013 Parade! I agree that Locked and Loaded would make a great knitting bag and that would be my choice. Your bag us great--I live the fabrics you used. Sara has great bag patterns! It's a hard choice, but I will choose the Accordion Bag as my favorite. I think I would pick the Velocity Girl Bag - love them all!! I am loving that Accordion Bag! That seems like the perfect one for me! I need to get busy on my UFO for Feb! Eeek! I was ahead at the beginning of the month but am behind now! Better get my bootie in gear! My favorite is the Locked and Loaded bag, but they are all beautiful! My favorite is the Dot Dot Dash bag...makes me think of my niece. My favourite is the Locked and Loaded bag! Is the closure easy to fit?? I like them all. I think the Dot Dot Dash bag is my favorite. Thanks for the chance to win. Gorgeous bag - great fabric choice!! I love the Locked and loaded bag or the Velocity Girl Bag!! Locked and Loaded is my favorite and I think my skill level. I do like Dot Dot Dash but I'm not advanced enough for three zippers yet! DOT DOT DASH,acho que daria conta de fazer este,Obrigada. I really like the velocity girl bag. I really like the locked and loaded bag. Velocity girl bag is my kind of bag. My favorite is Dot Dot Dash bag. I need to start using my zipper collection. That is a nice looking bag. I also like her Dot, Dot Dash bag. What a beautiful bag! You did a wonderful job! Love the Locked and Loaded but I think I'd choose the Dot Dot Dash pattern. Looks like lots of room and perfect are he three zippers on the side. Thank you and Sew Sweetness for a super giveaway and a chance to win. The Dot Dot Dash Bag is really cool with all those extra pockets! Thanks Aunt Marti and Sara! beautiful...love the lock and loaded, but I think I would pick Velocity Girl Bag!!! 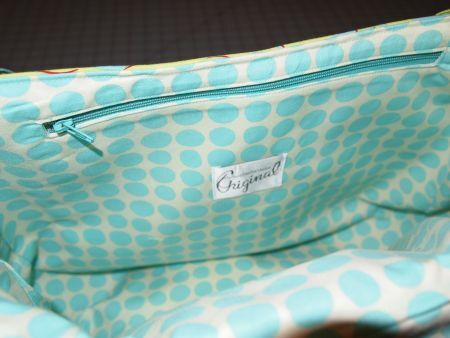 I would love to make the Dot Dot Dash bag,since I can always use another bag for my iPad! Thanks for sharing her site with us. Great patterns and I love what you've done with the bag you made! I think my pattern of choice would be the Velocity Girl Bag. I wonder if it would make me move at a faster speed? or maybe just make me look faster when I have it with me! Thanks for the great giveaway! The patterns all look great, but Locked and loaded is my favorite. Thanks for introducing this pattern designer! Like the acordion bag! Thanks for the chance to win! Ooooh, the Dot Dot Dash bag is wonderful. All those zipped pockets! Yum!! They all look like fun, but my favorite is the Velocity Girl Bag. I like all the compartments, because without them I'd never find anything! Thanks for the chance to win. Really like the locked and loaded! Locked and loaded is my favorite. Hum, I like Locked and Loaded but I never carry a bag that big. I like the cross body business so it's Dot, Dot, Dash for me. Thanks for the opportunity. Looked at them all and the best one for me is Locked and Loaded. Dot Dot Dash struck me, but so did l & L. Hmmm, choosing is always such a fun thing to do. I'll go with... um... uh... OK, DDD it is. I have learned to love the across the body since I moved to a major metropolitan area some years ago so DDD does it for me. Thanks for the chance to win. Lynda at LMI dot net. Well I love the one you made, but I also think the DOt Dot Dash would be fun to try!